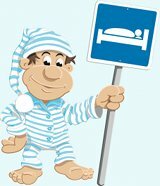 We're talking about sleep science and sleep medicine here on this site. These subjects can sometimes have a tendency to be explained pretty densely, with jargon that's difficult to utilize, by the scientists and doctors who spend their lives immersed in the specialist's point of view. If you aren't a specialist yourself, it can be hard to get much from an academic journal article written by and for these doctors or scientists. On the flip side, how much useful information does each new repetitive Yahoo sleep advice article really provide the rest of us? "We all know how great a good night's rest can leave us feeling, but did you know that proper rest and high-quality sleep can also improve your workouts and help keep you at a healthy body weight? It's true!" Really?! Thanks for that Yahoo... Exhilarating and enlightening stuff. At EYSD we try to demonstrate that we respect your intelligence. Instead of the typical sleep hygiene articles on repeat, or the technical academic articles that can be difficult to utilize, we strive to create meaningful content about the science of sleep communicated in a fun and relatable way. We believe that understanding the mechanisms at work in your own body to determine how alert or sleepy you feel will empower you to make strategic decisions to influence these mechanisms and optimize your alertness and sleepiness schedule. How do we go about sharing this information? The vast majority of content throughout EYSD is student-created, by the undergraduate and graduate students currently or formerly in Stanford Sleep and Dreams. Fueled by Dr. Dement's personality and the young energy of the students, Sleep and Dreams has a reputation of being one of the most fun classes around. The students feed off the energy and create entertaining, informative, and sometimes comedic videos, articles, brochures, and presentations each quarter, many of which are featured throughout this site. The idea here is that articles, movies, games, and such about scientific subjects that can tend to be dense will be more enjoyable and accessible when created by young people who have just been engaged in learning and researching about the subject themselves. Sometimes the best person to explain a subject to you is not the expert in the field, but the individual who has just grasped the subject themselves. This person is in the prime time to effectively communicate the method or rhetoric they used to understand the subject themselves, since the learning process just unfolded for them recently. Have you ever experienced this in a classroom setting before, where a teacher's lesson doesn't hit the mark, but a student's alternate explanation makes things clear and enjoyable? I know I have. And that's really what this site is about: making sleep science fun and accessible so everyone who wants to can take control of their own sleep health, strategically. Get going: Jumpstart your sleep education with our Sleep Essentials Mini-Guide. Of course, this student-driven approach naturally has its drawbacks as well, namely with regards to the amount of experience the authors have. While we are very careful in checking the accuracy of the information we publish on this site, and have a board of faculty and sleep professionals to oversee our work when they can, we recognize that it is entirely possible for some errors to slip through the cracks. If you notice any, or are compelled to critique any information published on this site, please let us know so we can continue to improve our content and create a valuable site. Growing is every bit as big a part of our philosophy as anything else. You can leave a comment on the appropriate page, if applicable, or contact us via email.